In 1H we have enjoyed learning some French today. Children learnt numbers up to 10 and the song Fere Jacques. The Old Denton Police Station/ Victoria Park! The Old Denton Police Station! The Old Denton Police Station used to be a court room inside. All police officers used to sleep there over night and pretty much lived there. It is now located in the police museum on Newton Street in Manchester. Since it had closed down years ago it has now been transformed into apartments. It was built in 1896 and sadly closed down years after it was built. Victoria Park! At Victoria Park there are a lot of fun activities to do at this place. You can play tennis and there are places to hide. There is also a place where little kids can have fun at the play ground. There is also a band stand there to. But years ago the band stand was broken and then it was rebuilt so you can still see it there today. On Tuesday morning an alien satellite came crashing to Earth and landed in Corrie Primary School’s playground. This isn’t the first time that something strange as happened as an UFO was spotted flying over the Easter Holidays. Today, 1H has enjoyed learning about the meaning of Shrove Tuesday and the start of Lent. We have looked at how different countries celebrate Shrove Tuesday/ Pancake day. In class, we learnt that people ate pancakes to use up their eggs, milk and sugar. 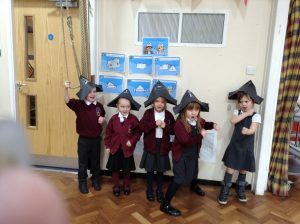 The Pirates have arrived in year 1, causing lots of mischief! They are looking for buried treasure and shiny jewellery. Roseanna, Charlotte and Lilly May all love to dress up in the Pirate outfits and looking for treasure. Today year 1 explored weather forecasting. We watched clips of the TV forecasting the weather. We looked at the British Isles and discussed North, South, East, West. We decided/predicted the weather for the different parts of the country before advising the audience of how to prepare for the day based on the weather! Welcome to year 1 spring term. What a busy term we have coming up. The creative curriculum topic for this term is Treasure. The children will be learning about famous Pirates in history and which Oceans the Pirates travelled. They will learn about the history of the royal navy. The children have a Pirate role-play area in the classroom so that they can dress up as pirates, learn sea shanties and look for buried treasure using a map. The children will be reading and writing stories linked to Pirates. This week they have been reading the story ‘Pirates love Underpants’ and re writing the story. This term the children will be writing instructional text linked to Pirates, learning poems, and sea shanties. The children will continue to consolidate their place value skills knowing numbers to 20.Knowing and learning number bonds to 10 and 20. They will begin to recognise coins and know the value of each coin to the value of £2. They will know the number 1 more and one less of any number to 100. They will become confident to count in 2s, 5s and 10. In this unit, children will learn that there are four seasons, the names for these seasons and that there are differences between them. They will identify and design weather symbols for the different types of weather they are likely to experience across the seasons. Working scientifically, children will make observations and measurements over time throughout the seasons including day length, temperature, rain/snow fall, wind strength, cloud conditions and the accompanying changes to plants and animals in their local environment. They will describe and record their findings and compare them across the seasons. The children follow the Charanga music program with Mr. Derbyshire each week. We will be visiting St Mary’s church and looking at the role of baptism for Christians. Please remember your child’s book bag and reading book each day. P.E. days are Monday and Thursday. Homework is given out on Friday and need to be returned no later than Wednesday. Please remember to practise the year 1 key words as the children need to be able to read and spell the words. 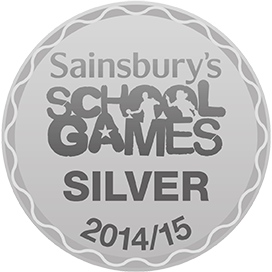 Thank you for your continued support from all the year 1 team. Mrs Rafferty, Miss Hope, Miss Machin, Mrs Hoof and Mrs Bagley. All ready for our Christmas Dinner! In science I have enjoyed finding out about mammals, fish, amphibians and reptiles and beginning to design a zoo.